This constantly seems to be a request on Stack Overflow, and the fact that documentation for Google’s Speech API is practically non-existent, I have decided to share an implementation of it with everyone. If you just want the source code here you go. First off, your audio must first be encoded in the FLAC audio format for Google’s Speech API to accept it. We will not be transcoding audio in the Python script, so you will have to do it before hand. If you need an easy to use tool to convert your audio files, give fre:ac a try. It is a free, open-source, converter for Windows, Mac OS X, Linux, and FreeBSD. Alright now on to the good stuff. 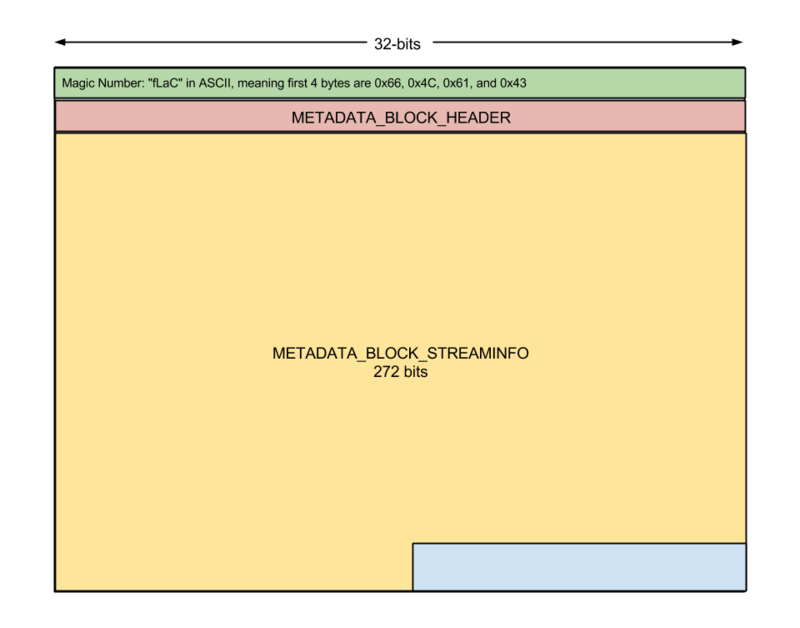 The first METADATA_BLOCK is ALWAYS the STREAM_INFO block. The first bit in the METADATA_BLOCK_HEADER simply marks whether this METADATA_BLOCK is the last one. The next 7 bits mark the BLOCK_TYPE, and then the last 24 bits mark the length of METADATA to follow the header. print "not a fLaC file!" if ord(flacBits) == 0: # STREAMINFO BLOCK FOUND!! Pretty easy right? the python ord() function returns the number of a byte string — the inverse of chr() (which turns a number into an ASCII character). Since STREAMINFO is never the last block, the first 8 bits of the METADATA_BLOCK_HEADER should be 0’s for the STREAMINFO block. 0 for the first bit, and 0’s for the next 7 bits. So now that we can determine what is and is not a FLAC file, let’s go ahead and start pulling out the information we need. We only need to tell Google the Sample Rate of the file, however since we are already here why don’t we get as much information as possible. So going through and parsing this block of data is pretty straight forward. Let’s go ahead and just store the information as we go through them. When it comes to handling raw binary data in Python, struct is a very useful library! We should use it! The most useful feature will be the unpack() method. Make sure you consult the Format Characters chart if you’re not sure what they mean. All numbers are big-endian, so we are using the ‘>’ character before our Format Characters. print "not a fLaC flacBits!" if ord(bytes) == 0: # STREAMINFO BLOCK FOUND!! That’s all the information we need from the FLAC file, how about we turn this into a Class so that it is easier to use. We will rename some things as well as add some error messages so we can catch errors before trying to send the file to Google. class fLaC_Reader(object): error = "" sampleRate = 0 channels = 0 bitsperSample = 0 length = 0.0 minBlockSize, maxBlockSize = 0, 0 def __init__(self, file): bytes = file.read(4) # get Magic Number if bytes != "fLaC": self.error += "Not a fLaC file! 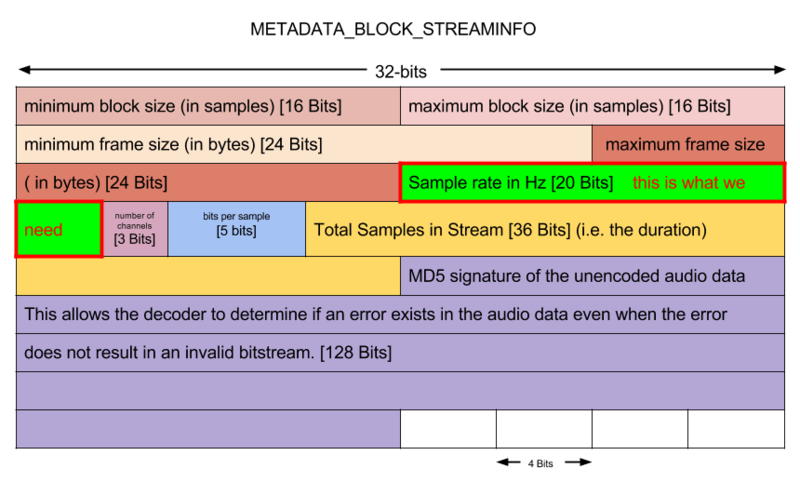 Aborting\n" bytes = file.read(1) # Get STREAMINFO metadata Block Header if ord(bytes) == 0: # "STREAMINFO BLOCK FOUND" # Jump to the STREAMINFO Block, 24 bits from here. file.read(3) # parse STREMINFO BLOCK self.minBlockSize, self.maxBlockSize = unpack('>HH', file.read(4)) self.minFrameSize = unpack('>I', '\x00' + file.read(3)) self.FrameSize = unpack('>I', '\x00' + file.read(3)) if self.minBlockSize < 16 or self.maxBlockSize < 16: self.error += "Invalid Block Size! Aborting!\n" # if minBlockSize == maxBlockSize: # print "Fixed Blocksize: %d samples" % maxBlockSize sampleInfo = file.read(8) sampleInfoBytes = unpack('>Q', sampleInfo) self.sampleRate = sampleInfoBytes >> 44 self.channels = ((sampleInfoBytes >> 41) & 7) + 1 self.bitsperSample = ((sampleInfoBytes >> 36) & 0x1F) + 1 self.length = (sampleInfoBytes & 0x0000000FFFFFF) / float(self.sampleRate) else: self.error += "STREAMINFO BLOCK not first\n"
self.error += "Not a fLaC file! Aborting\n"
if ord(bytes) == 0: # "STREAMINFO BLOCK FOUND"
# Jump to the STREAMINFO Block, 24 bits from here. self.error += "Invalid Block Size! Aborting!\n"
self.error += "STREAMINFO BLOCK not first\n"
Now that we can get the information we need out of a FLAC file, we can send it to Google for transcription. There exist a couple of endpoints for the Google Speech to Text API; we will be using Google’s full-duplex API. The full-duplex version does not have a limit on file size, or length, and is what Chrome uses for their fancy Web Speech API. The only problem with the full-duplex one is it does require an API key to use, and can be a little tricky due to the fact that Google has not made ANY documentation available for it. For more details about the other API endpoints, or how to get an API key, see my earlier post about it. There are a lot of other options like grammar for specifying a particular grammar engine. To be honest, I have no idea what grammars are available. Files with long silences in them will have multiple final: true sections returned! The tricky part is getting the Download and Upload streams to function simultaneously and asynchronously. Sounds like a perfect job for Python Threads and the incredibly useful Requests library! self.api_key = "ENTER YOUR API KEY HERE"
def gen_data(self): while True: item = self.file.read((self.flac.minBlockSize * self.flac.bitsperSample) / 8) if item: yield item else: if self.no_result or self.timeSinceResponse > 2: return #Google is Done Responding, close UpStream time.sleep(.5) self.timeSinceResponse += .5 yield "00000000"
It goes through the file in manageable blocks based on the BlockSize and bitsperSample, making it a multiple of 8. Once it is done uploading, since we can’t easily check the upstream for a response from Google we can use the interim results being returned from Google to gauge when Google is done with the file. If we don’t hear anything after 2 seconds after Google has started sending results, it’s pretty safe to assume we’re done. In the meantime, we need to keep the Upstream open by sending Google dummy data. In this case it’s just a string of 8 zeros. The last helper function we need is one to help us check if a response is a final:true response. Okay. Now to the controlling the Threading and the Upload and Download streams. How about a function aptly named start()? This will kick off the threads for the Upload and Download streams. It will also close the threads once the streams are finished. We are using a Request Sessions for each Thread, as a Session is not Thread safe– although it usually works most of the time if you use only one Session for both the upstream and downstream. We can also skip the whole hassle of sending the file to Google if it’s not a valid FLAC file. The stop() function is simple. We call join() on both of the threads. Join() will simply wait for the threads to finish, and then close them. The rest of the python script will wait for the Join() to finish before executing the next line. So we can actually time how long Google takes to Transcribe an audio file. The Downstream is a little more complicated. We are going to be mimicking the Deterministic Finite Automata that Chrome uses for interacting with the Speech API, but in a much more basic and crude way. We need to know what state we are in, 1. Not Connected, 2. Successful Connection, 3. If we have received a second empty response after a Successful Connection, 4. If we have started receiving responses, and 5. If we have a final result. With the stream=True parameter we can access the responses as they come with the iter_lines() method. We store the response in the self.response variable, as that is what the self.final() function checks. If it’s a final result we add it to our results, and keep going. Our Downstream will keep listening for responses until the Upstream is closed. The upstream will only close when the Downstream quits receiving responses. So every time we get a result back from Google we reset the timer to keep the Upload stream going. If we don’t hear anything for 2 seconds, the Upstream is closed, and the Downstream finishes. Pretty cool huh? Just like the upstream we are also going to restart the connection if it was unable to connect. Well, that is all you need to have audio files transcribed by Google! Let’s write a quick script that utilizes our two new classes! I will also need to add a couple more imports to make everything work at the top. Now I can simply open a file, start the transcription, and time it! Here is the complete source code / working example (minus an API key). This is a cool project, but you didn’t post a license of the code. Are you cool with me including it in a GPL project? I basically just examined Chromium source code and the FLAC documentation. So I didn’t even think about licensing it. Feel free to use it! If anything I’m thinking this would fall under the MIT license as I have no plans to maintain it or develop it passed the proof of concept. I would be flattered with just a mention in a comment if this helped you in any significant way. Thanks for asking! Below are the issues which i faced while transcripting an audio file of 124 sec. Hey Raghuvaran , I too am getting the same errors . Were you able to find any solution for the same . I am unable to get any STT operation done . Excellent work..! its awesome ! Its working well…. Thanks!!! What do you think, why? Good tutorial. But I have one problem: your code don’t recognize words uft-8 from flac files. How I solve this problem? I MUST solution for academic project. Best Regards. I added # –– coding: utf-8 –– on first line your code. I tried print “accents:áéíóúãõç” and worked right. But results from Google with words utf-8 didn’t fix. I saw this table: http://www.utf8-chartable.de/unicode-utf8-table.pl?start=128&number=128&utf8=string-literal&unicodeinhtml=hex and \xc3\xa9 corresponds “é”. But this method isn’t good practice. It is possible fix this problem? Hi again. I tried your code but didn´t work in me. I deleted #– coding: utf-8 — on the first line and your code didn´t work. I MUST use #– coding: utf-8 — on the first line and I fixed Unicode words in script PHP I created. Sorry. I tried again and your code fixed Unicode words, but ONLY works with adding #– coding: utf-8 — on the first line. Thanks a lot. Holy crap! Small world! I just finished skimming this and had no idea who had written it! I was so blown away by the truly rare balance of being thorough and yet easy-to-read, I had to check out who the author was… lo and behold, not only do I know this dude, it’s my father! I’m curious if he is your biological father, because his last name is different from your’s and looking at a photo of him he looks younger than you. Sorry, my comment is probably confusing… we were LDS missionaries together in Otaru, Japan. He was my first companion (missionaries are always in companionships of two or three), and, as they are largely responsible for training you, your first companion always makes a big impression on how you serve as a missionary. We would always joke about your trainer being your “father” because the influence is so profound. I was really, really lucky to have Travis as a trainer—he was really well-known in the mission for loving the people he served unconditionally, and I did my best to emulate that. It’s pure coincidence (hence my shock) that we both happen to work on the same sort of problems professionally. Awww Thanks! That really made my day this morning.